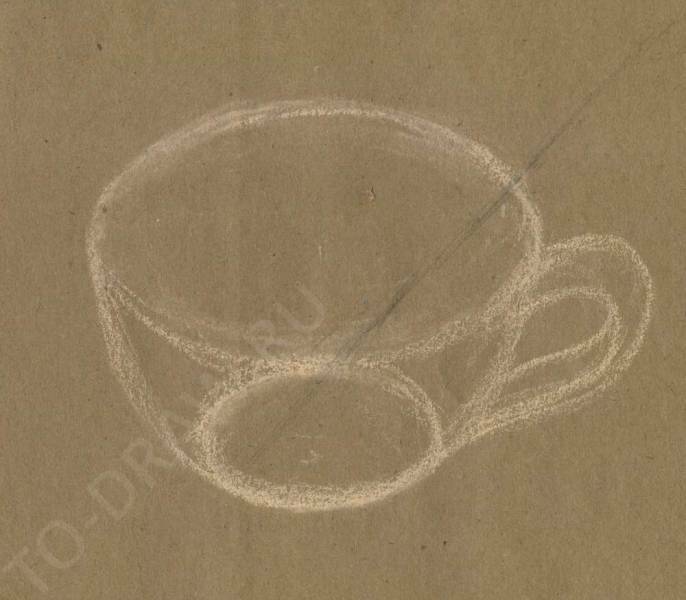 How to draw a Cup with a spoon pencil step by step? Draw with pastel pencils. 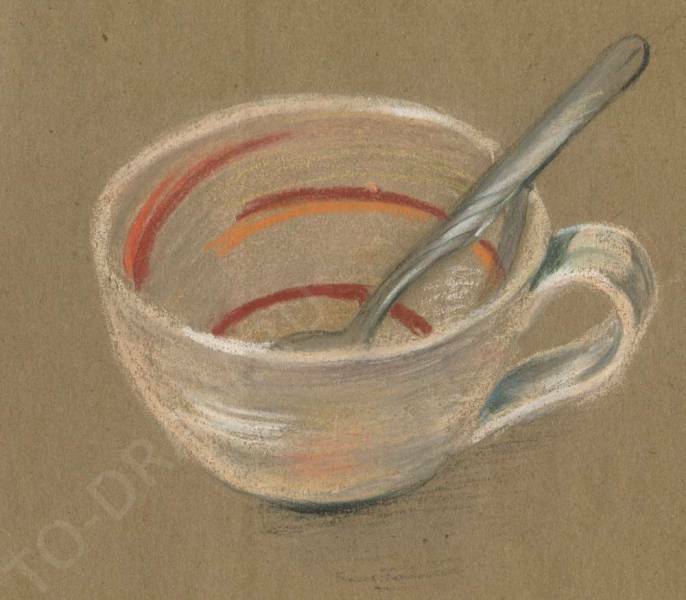 Today we will do a quick sketch pastels and pastel pencils cups and spoons. Try to transmit in the figure, the two material - ceramics and metal. As has become a tradition, we will draw on craftool paper, which is quite "rough" to keep yourself at least some amount of pastels. Of course, you can use special paper for pastels, but Kraft more economical option and to train you. The first thing we will do an initial sketch of a Cup - top view. To do this, use pastel chalk. The position of the spoon shape until one line - for this I used a simple pencil. The figure in the first stage should be transparent, in order to accurately understand the state of things in space and as accurately as possible to pass it in the picture. For example, the edge of the spoon should touch the bottom of the Cup and should be visible only on the periphery of a spoon. Draw a preliminary sketch of the Cup. Then draw the shape of a spoon. Her position will be easier to pass if You will pay attention to the angles which are formed by the intersection of spoons and cups. When the draft is ready start putting in pastels. First we do it in broad strokes/the strokes of pastel chalk. For Cup use pink, yellow-orange, light coral color. On the outside of the Cup blend a little cold tones. 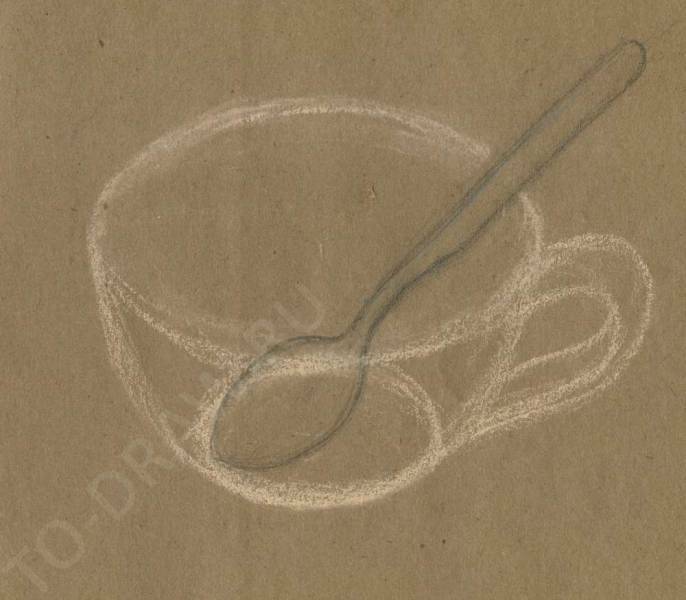 Spoon drawn in grey, white and ochre for reflection in the metal from the Cup. 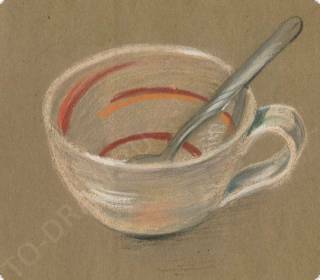 The edge of the spoon in some places clearly outlined in gray pastel pencil. Draw a spoon on the figure. For shadows, use cool colors - Indigo, grey, and in some places add warm touches. The shadow on the handle emphasizes the shape of the handle and go rather rapidly. White to add highlights on the handle and the Cup. Fill the picture color and add shadows. Added contrast and sharp picture. Don't forget about the shadow on the inner surface of the Cup from a spoon. The shadow follows the form of a Cup. 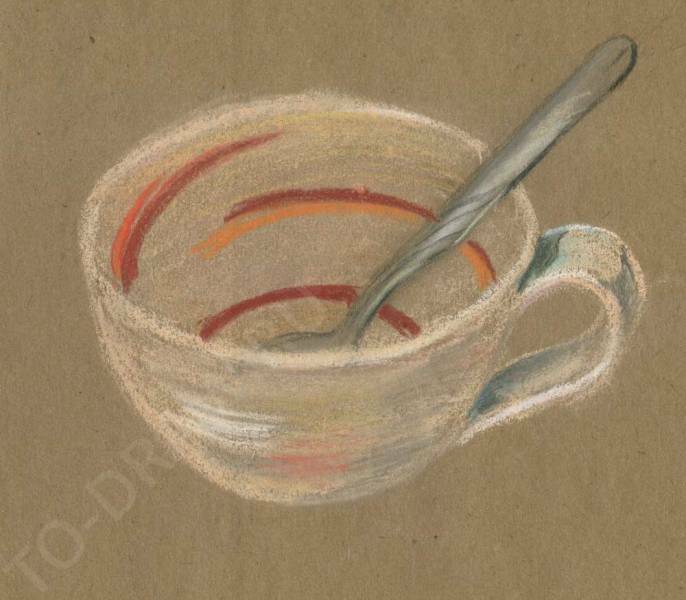 Add a spoonful of glare and reflex - reflection of the warm orange color of the Cup. And at the end draw a shadow under the Cup on the table surface. For precise thin lines use finely honed pastel pencils, and for filling large areas with color crayons. Note that in this sketch we almost didn't restorefile strokes, and just narratively them to each other and thereby the colors were mixed up in the process.